The “c” in iPhone 5c could be said to stand for “color,” but it could as easily stand for “China”—as in the country’s exploding smartphone market. At only $100 cheaper than its top-shelf counterpart, the 5c is still more expensive than the average smartphone, but hardly represents a race to the bottom. While that might be interpreted as generic CEO-speak, the initial reviews of the iPhone 5c appear to agree with Cook’s sentiment. Most reviewers described the phone as a revamped version of last-year’s well-received iPhone 5, but with a fashionable new exterior. It’s easy to view today’s mobile marketplace as an analogy to the desktop wars of the 1990s, with the part of Windows being played by Android while Apple remains the smaller premium player. Despite its growing dominance in the marketplace, Cook views Android’s chaotic fragmentation as a weakness that even Windows never faced. “I don’t think of Android as one thing,” Cook commented. The current state of the market bears that out: less than half of Android users are using the latest version, Jelly Bean, while a full third of Android users are still using Gingerbread, which came out in 2010. And that’s not to mention that each manufacturer of Android devices is free to cultivate their own forked version of the OS. This is certainly not the ideal system for developers of third-party apps, who have to deal with all these various flavors. And it’s an issue that will only be exacerbated with the introduction of Android Kit Kat. 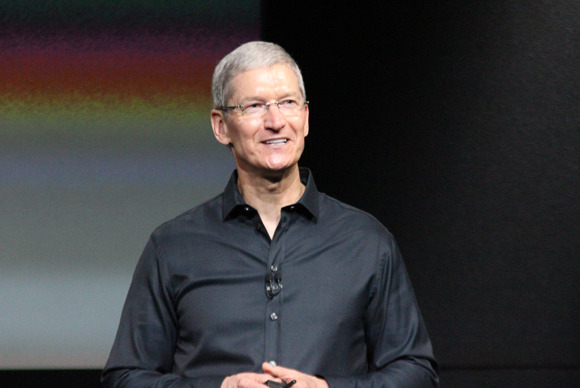 “Everybody is attempting to adopt Apple’s strategy,” said Cook. And that bit of boasting is largely backed up by the business moves of the past year. Even as Microsoft still attempts to push its Windows Phone operating system, the company has doubled down on hardware with its recent multi billion-dollar purchase of Nokia. Similarly, Google has continued its move away from its software roots with its purchase of Motorola Mobility. Conversely, Samsung appears to be interested in cultivating its own software ecosystem, holding its own developers conference for the first time. Let’s not even mention everyone trying their hand at dedicated retail shops. The peanut gallery has been sounding off on Apple’s innovation problem since the late Steve Jobs stepped down from his leadership role. Whether the supposed innovation problem is actually a source of legitimate concern remains debateable, but it’s at least something Cook is aware of.